One of the last claims in Colin Powell's presentation to the UN Security Council on February 5, 2003 blew away like dust in the wind late last week in the Old Bailey, London's central criminal court. The trial of the infamous "UK poison cell," a group portrayed by Secretary of State Powell as al Qaida-associated operatives plotting to launch ricin attacks in the United Kingdom and in league with Muhamad al Zarqawi in Iraq, found nothing of the sort. The jury did find "the UK poison cell," known as Kamel Bourgas and others (Sidali Faddag, Samir Asli, Mouloud Bouhrama, Mustapha Taleb, Mouloud Sihali, Aissa Kalef), not guilty of conspiracy to murder by plotting ricin attacks and, generally speaking, not guilty of conspiracy to do anything. Kamel Bourgas had been previously convicted of murder of a British policeman in an unpublicized trial. Two days after the January 5th search of the Wood Green "poison cell" flat, and well before the outbreak of war with Iraq, the chief scientist advising British anti-terrorism authorities, Martin Pearce -- leader of the Biological Weapon Identification Group at Porton Down, had finished lab tests which indicated the ricin finding was a false positive. "Subsequent confirmatory tests on the material from the pestle and mortar did not detect the presence of ricin. It is my opinion therefore that toxins are not detectable in the pestle and mortar," wrote Pearce in one document. At the time of Colin Powell's presentation to the UN Security Council, expert sources in this matter within the UK government surely knew that no ricin had been recovered from the Wood Green group of alleged terrorists, men included by the Secretary of State as part of the US government's rationale for going to war with Iraq. Whether Powell, the Bush administration or U.S. intelligence also knew is unknown. Whatever the case, it was another example of the United States' horrendous intelligence on weapons of mass destruction. British anti-terrorist branch men swooped down on suspected terrorists in the north and east of London in September of 2002 and January of 2003. In one operations on January 5, the plant poison ricin was claimed to have been found in an apartment above a pharmacy in a place called Wood Green. The news flashed around the world. Looking back, tension was high and TIME International wrote in a story entitled "Poisonous Plot:" "Watching the police officers come and go, some of them in protective white suits and masks, and seeing the long hours they spent in the top-floor apartment above a local pharmacy, neighbors in North London's multiracial Wood Green section knew that something big was up." Several suspected terrorists were arrested. One at Wood Green, others connected to a raid at the Finsbury Park mosque and one, Kamel Bourgas, a week later, in Manchester. Bourgas stabbed and killed a police officer in the Manchester raid. At the apartment in Wood Green -- a "residue of ricin" was said to have been found. "A presumed al-Qaeda terror lab had been shut down." "... [but] police feared that some of the deadly product was [gone] too. Had terrorists got away with enough of the toxin to launch a strike?" the article continued. There was much speculation and other police interviewed by the BBC weren't so sure, conceding that ricin could have been removed from the apartment prior to the raid but that this was "highly unlikely." The alleged existence of ricin and "the UK poison cell" in January 2003 would subsequently play a part of Colin Powell's presentation as rationale for war against Iraq. 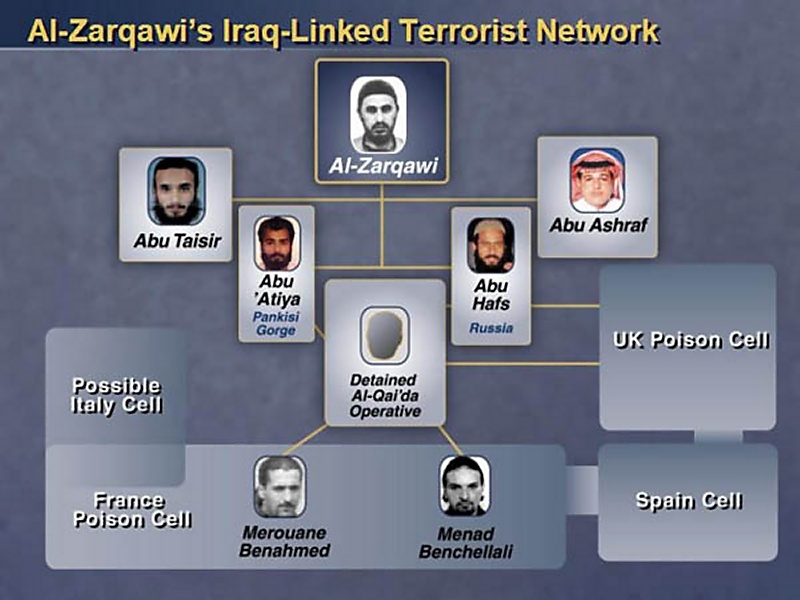 In his speech to the UN Security Council on February 5, 2003, Powell purported to show how a web of terrorists including the UK cell, was interconnected with Muhamad al Zarqawi, who was said to be directing terrorist plots from the safe refuge of Iraq. There was a theory and allegedly intelligence on the UK cell and the Wood Green ricin within the US government. On February 12, for example, CNN reported that Colin Powell had contended the British ricin had actually come from Iraq in a story entitled "Europe skeptical of Iraq-ricin link." "The ricin that is bouncing around Europe now originated in Iraq -- not in the part of Iraq that is under Saddam Hussein's control, but his security forces know all about it," Colin Powell was alleged to have said. An anonymous source in the UK disagreed: "... British authorities 'are clear' that the [ricin] was 'home-made.'" Hundreds of news articles appeared in the coming months on the Wood Green terrorists and their toxin. Perhaps some of these men had been connected with terrorists training in the Pankisi gorge. Maybe the ricin was going to be used in a subway attack. As GlobalSecurity has learned, none of this was true. There was no ricin. And no other poisons were detected. No capability was exhibited to be in the hands of the defendants. Kamel Bourgas was convicted of a murder that was not an act of terrorism but a tragic consequence of the collision of a police raid and one bad man. All the rest were nobodies, now presumably to be free men after extended stays in an English high security prison for terrorists. And although a scientist at Porton Down had determined that the ricin finding was in error, this news was not generally conveyed to the world. In fact, the exact opposite transpired. The story of alleged ricin discovery at Wood Green had made, and would continue to make, a very big noise. GlobalSecurity.Org was appraised of the findings and materials secured at the Wood Green apartment. Also seized at Wood Green were notes purporting to show how to purify ricin. These notes, according to a witness statement to the raid, were written in a "foreign script," Arabic. The words "ricin," "DMSO," "H2O2" and "SODIUM FERROCYANIDE" were written in English in these notes. Notes addressing the poison ricin were translated and contained reference to grinding 5 grams of castor seeds. A mixture of four parts acetone to one part seed was suggested to set for three days before filtering. The result could be dissolved in 20 ml of DMSO, the solvent dimethyl sulfoxide. Other notes addressed solanine, nicotine, botulinum, cyanide and a list of common chemicals that can be used to make improvised explosives. One key point to understanding why the "UK poison cell" was not a UK poison cell and why it was not connected to al Qaida can be found in the nature of the ricin recipe recovered at Wood Green. Originally, the British prosecution claimed that between January 2002 and January 2003, Bourgas and others plotted to commit acts of terrorism. This group, charged the prosecution, planned to use poisons and explosives to cause death and mayhem in furthering an extreme Islamic cause. To do this, the prosecution would have to link its ricin recipe to al Qaida. However, the distinguishing characteristic of the recipe for ricin, including the one cited in the terror trial, is the ratio of acetone used to wash the weight of castor seeds. It is -four to one-, a marking characteristic of its origin in American sources. Kurt Saxon, originally published it in a pamphlet called "The Weaponeer" in 1984. (Currently it can be found in Saxon's "The Poor Man's James Bond," Vol. 3," 1988.) "Put the hulled [castor] beans in a ... blender with four ounces of acetone to each ounce of beans." The second major source for ricin recipes of this nature is Maxwell Hutchkinson's "The Poisoner's Handbook," a non-expert unscientific tome published by Loompanics in 1988. Hutchkinson's recipe for ricin is a derivative of Saxon's "method." It is in this way that GlobalSecurity became aware of the trial of Bourgas and others as it proceeded. Senior Fellow George Smith, Ph.D., was consulted by an expert witness and scientist for the defense lawyers on the nature and provenance of ricin and other allegedly poisonous recipes seized for the case. Relevant materials from Saxon and Hutchkinson originals were also furnished. It was the British prosecution's aim to link the "UK poison cell" to al Qaida by associating its ricin and poisons recipes with documents of Afghan -- read al Qaida -- origin. It cited three documents of interest: the "Manual of Afghan Jihad" seized in an information gathering raid in Manchester in 2000, notes found in English and Russian in Kabul in 2001 and notes found in Kabul, written in Arabic, also in 2001. In a mini-trial within the trial, the prosecution's claims became unconvincing for a number of reasons. The "Manual of Afghan Jihad" was obtained in Manchester in April 2000 by British anti-terrorism agents and subsequently turned over to the FBI's Nanette Schumaker later that month and contains sections on poisons. Its ricin recipe is clearly taken from Hutchkinson and Saxon and although it is of similar nature to the recipe in the Bourgas trial, it is not identical. In the manner of details, the "Manual of Afghan Jihad" calls for the use of lye in the treatment of castor seeds. The use of lye was subsequently dropped for many methods found in terrorist literature and it also does not appear in the Bourgas recipe. Other portions of the "Jihad" recipe straighforwardly descend from Hutchkinson, including the reference to DMSO. And still other fine details separate it from the Bourgas formulation. A further knock on the "Manual of Afghan Jihad" as an al Qaida source comes from its apparent origin in the first jihad against the Communist occupation of Afghanistan, prior to al Qaida. The "Manual of Afghan Jihad" was the property of Nazib al Raghie, also known as Anas Al Liby to the US government. At the time the manual was taken off al Raghie in Britain, UK authorities were not interested in him. Neither, apparently, was the FBI and he was not arrested. These days, al Raghie, as Al Liby, is on the FBI's list of most wanted terrorists. The "Manual of Afghan Jihad's" ricin recipe was fairly obviously not the same as the one presented as evidence in the trial and a representative of the defense added that its appellation as an "al Qaida manual" was and is an invention of the United States government. More to the point, it was the work of the Department of Justice because nowhere in the manual is the word "al Qaida" mentioned although one could find it entitled as such on the DoJ website copy. The prosecution could also not link the Bourgas poisons recipes to the notes found in Kabul in 2001 in Arabic, English and Russian. The ricin recipe in the Bourgas case is not finely identical to any of them. This was a development that contributed to the British government's failure to convince on claims as to the origins of the alleged ricin plot. Ultimately, the two base sources for ricin recipes of this nature are Saxon and Hutchkinson. And since the publication of those two in the United States in the Eighties, the recipe has been copied to other pamphlets and the Internet, some of them created by jihadists. Along the way, the ricin recipe -- and other poison purification methods associated with it -- have picked up trivial modifications. These changes do not separate the ricin recipe from its common origins in hardcopy by Saxon and Hutchkinson. But they do distinguish the subsequent recreations of it from each other. The Bourgas note on ricin falls into this category. The UK prosecution experts from Porton Down could not grasp the import of it. They were oblivious that the methods of Saxon and Hutchkinson had migrated to the Internet and that a variety of different copies, derived from the two, had accumulated. In the end, the sources for the Bourgas notes, like the seized list of common chemicals used in explosives, were found on Yahoo, another American property. The other poison recipes presented in the Bourgas case were equally trivial affairs, addressing solanine, nicotine and botulinum. Primarily, they were functionally descended from Hutchkinson as the original source. In addition, there were silly notes on isolating "cyanide" from "cup of apple seeds or apricots 10,000 [sic], peaches, plums or cherries" by grinding them, heating the result in lukewarm water and filtering. The "UK poison cell" defendants were on trial for six months. In the British anti-terror sweep that netted them, there were 90 arrests. Nine people were charged and none have been convicted. Kamel Bourgas was justifiably convicted of a dastardly murder of a police officer during the raid in which he was taken into custody. But that murder was not terrorism. Bourgas has also been convicted of conspiring to cause a public nuisance. The notes on purported poison schemes were, apparently, the creation and property of Bourgas, not others lumped in with him. And a second terror trial, planned to start after the Bourgas case, will be short-circuited according to the prosecution since there is even less evidence for it. 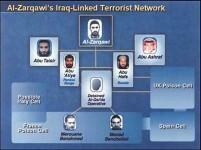 There was no UK poison cell linked to al Qaida or Muhamad al Zarqawi. There was no ricin with which to poison London, only notes and 22 castor seeds. There was no one who even knew how to purify ricin. However, the mythology on the UK poison cell will probably always be with us. In only one example of many, a United Nations investigative arm published a report in February 2005 with the claim that an al Qaida "associated" group had come close to launching a poison attack in the United Kingdom before being arrested. (Source: Milton Leitenberg, "Assessing the Biological Weapons and Bioterrorism Threat," advance copy of a paper prepared for international conference, "Meeting the Challenges of Bioterrorism," April 22-23, 2005, Furigen, Switzerland). The news was too terrible and repeated too often to easily replace as common wisdom. Indeed, there will be many convinced that justice was not served, that a poison plot was foiled and that convictions would have been certain if only the -right- evidence had been presented and taken seriously. They will think that the case of Bourgas and others was a defeat in the global war on terror. See Follow-up: MORE UK TERROR TRIAL: Evil foiled or more mendacity?